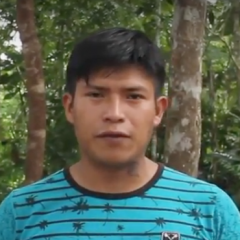 Wiliam San Nicolás is a member of the Kichwa Peoples of Sarayaku located in Amazonian Region of Ecuador, and which has held long fights at a national and international level to stop extraction projects in their territory. The following is a transcript of the video of Wiliam's comment of the word cloud for the term “Sarayaku“. Within the word cloud, the lack of the term “educación” (education) attracted Wiliam's attention. I’m surprised that there is only scientific knowledge in the word cloud because there is ancestral knowledge in the Sarayaku indigenous community that goes back many years. However, that knowledge has been getting lost, especially in education. I would like to see that ancestral knowledge appear in the word cloud.